What does this do for the agent This system gives the agent a way to connect with customers using mobile phones while out looking at properties. The customer stops at a property and views the flier. The flier has a QR code. They scan the QR code to quickly bring up the website for the property. Before they see the mobile website for the property they are asked if they want to be on the agent's text message list to be notified of similar property deals that are newly listed in the area. Then they see the mobile website. A prominent button on any good mobile website will be "Tap to Call" button. This is the button that makes it easy for the mobile phone user to quickly call the agent. This is the purpose of a website in the first place! To connect the customer with the sales agent. Hooray, connection is made. Maybe they will ask you to come and show the property to them. Now you have a warm lead. Other information on the Mobile Website allows the customer to easily view information about the property. Since there is some difficulty in viewing and reading a large amount of property information on a small mobile screen, we try to keep it to just the most critical information. Contacting quickly and property information is not all the value offered though with our mobile website for properties. Sharing is another great value! Say Jill takes a walk in her neighborhood and sees the new For Sale sign on a house she walks by. She takes a look at the flier and thinks this property is just what her friend's family has been looking for. She scans the QR code, goes to the mobile website and decides to share this website URL with her friend on Facebook using one of the sharing buttons on the property website. Wow, she just expanded the reach of the information to another potential customer that might have never come by the property. When the friend clicks the link to the website, they will be asked whether they want to be on the Agents texting list for more property deals too. Moral of the story: increased exposure offers increased sales. We hope you can see the potential of this new system... Please call us or use our inquiry form to contact us and let us know you are interested. 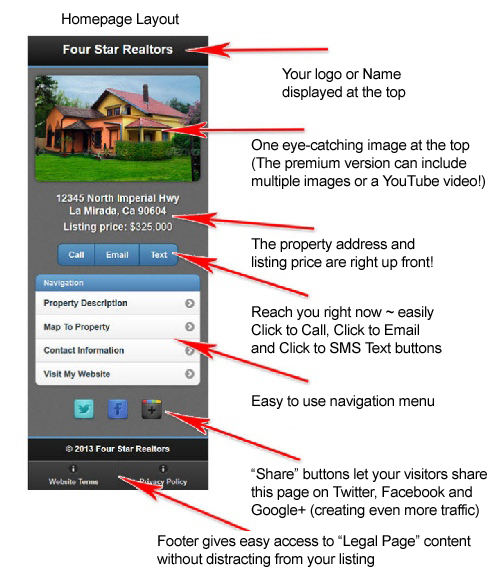 Our kickoff pricing for setting up each Mobile Website for Properties is $ 75 per property. This includes setting up a collection of Opt-ins for texting about more property deals. Limited to the first 10 Real Estate Agents that signup for this service. Would you like to see a demo? (Note: the Mobile Website looks much better on a mobile phone than on a desktop.) click here https://bellrock.net/realty/demo/ OR use your smart phone and type in bellrock.net/realty/demo or you can scan this QR code to get there easily: Features of our mobile friendly property websites: Note: the "Click to SMS Text" button will work on many smart phones, but not on all. Let our new service help you be the top performing superstar that the others want to be! information the way they want it - "on their smart phone"
After the first site the cost will only be $60 per property. We will give you 100 postcards to promote this new service with front design as shown below and with information for the back to be printed custom according to your instructions. After the first 100 free postcards, they can be purchase for $15 / 100 cards. A complimentary QR code will be supplied for each property listing. Would you like to see a demo?? click here https://bellrock.net/realty/demo/ OR use your smart phone and type in bellrock.net/realty/demo or you can scan this QR code to get there easily: Features of our mobile friendly property websites: Note: the "Click to SMS Text" button will work on many smart phones, but not on all. Most real estate agents have a website and most have resources in place to print real estate fliers. What most do not have is a good way to connect with customers on mobile phones. Today there are more mobile phone users than desktop computer users on the internet, this means the real estate agents are missing a very large number of potential customers. Customers that use mobile phones do not want to look at real estate websites that are setup to be viewed with a desktop computer. The difference in screen size makes viewing a bad experience. They want to get to the key information they are interested in and they do not want to have to go through magnification gyrations to get this information. A website that is design for mobile viewing is what they want. This system gives the agent a way to connect with customers using mobile phones while out looking at properties. The customer stops at a property and views the flier. The flier has a QR code. They scan the QR code to quickly bring up the website for the property. Before they see the mobile website for the property they are asked if they want to be on the agent’s text message list to be notified of similar property deals that are newly listed in the area. Then they see the mobile website. A prominent button on any good mobile website will be “Tap to Call” button. This is the button that makes it easy for the mobile phone user to quickly call the agent. This is the purpose of a website in the first place! To connect the customer with the sales agent. Hooray, connection is made. Maybe they will ask you to come and show the property to them. Now you have a warm lead. 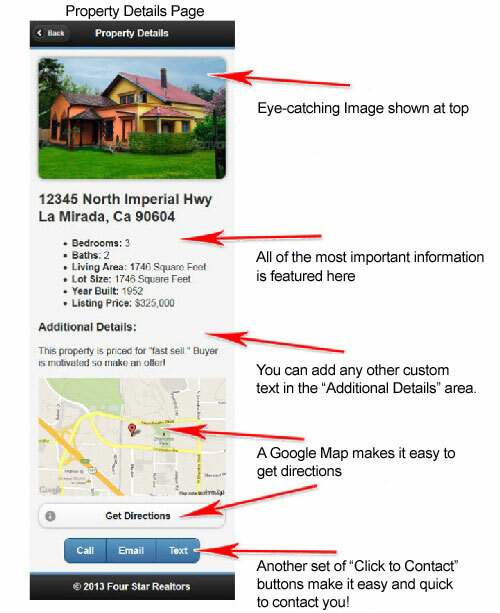 Other information on the Mobile Website allows the customer to easily view information about the property. Since there is some difficulty in viewing and reading a large amount of property information on a small mobile screen, we try to keep it to just the most critical information. Contacting quickly and property information is not all the value offered though with our mobile website for properties. Sharing is another great value! Say Jill takes a walk in her neighborhood and sees the new For Sale sign on a house she walks by. She takes a look at the flier and thinks this property is just what her friend’s family has been looking for. She scans the QR code, goes to the mobile website and decides to share this website URL with her friend on Facebook using one of the sharing buttons on the property website. Wow, she just expanded the reach of the information to another potential customer that might have never come by the property. When the friend clicks the link to the website, they will be asked whether they want to be on the Agents texting list for more property deals too. Moral of the story: increased exposure offers increased sales. Please call us or use our inquiry form to contact us and let us know you are interested. Our kickoff pricing for setting up each Mobile Website for Properties is $ 75 per property. This includes setting up a collection of Opt-ins for texting about more property deals. Limited to the first 10 Real Estate Agents that signup for this service. Note: the “Click to SMS Text” button will work on many smart phones, but not on all. As a Real Estate Agent or Agency, I am sure you have worked on ways to set apart your services from your competitors in order to get more listings. We are offering a new way to help you accomplish that task. There are many large agencies that have mobile friendly websites which can be found on mobile phones, but not many offer a mobile website for each property listing. A mobile friendly website for each property listing gives potential home buyers with mobile phones immediate access to information on the home of interest. The person with the mobile phone could be using the phone for property searches or they could be driving around looking at properties for sale. By offering this extra capability with your listings service you now have a way to differentiate your service from other real estate agencies to get more listings.